The World Is Over. Have A Cute Robot. Oh look, another bleak indie survivial game for the PC. Only this one has...isometric visuals? And a helper robot? And a soundtrack by the wonderful Mitch Murder? OK, Impact Winter, I’m very interested. There’s a lot to like about this clip, which introduces us to some of the game’s basics. The way damage to a building affects how warm it is, how your inventory works, how you’re not trudging through the future wastelands alone, you’re the leader of a band of survivors. But the stuff about having to carry your little robot helper around when/if it runs out of batteries sounds the most interesting. Normally it buzzes around aiding the player with mapping, light, etc, but if it goes down, you have to carry it manually, which not only robs you of the assistance, but saps your strength and speed as well. 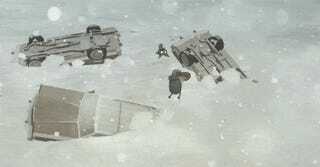 Impact Winter is tentatively due out on PC next year.